Townes and Ellie White: Townes and Ellie White on their first day in Kindergarten. “What would happen if our son lost protection for his pre-existing conditions? I hold Bob Corker and Lamar Alexander responsible if they vote to confirm Kavanaugh to the Supreme Court because this lawsuit is winding its way through the courts and the stakes are real for families all over Tennessee and for children like my own,” said April White of Knoxville. White had twins, a boy and a girl. They were born ten weeks early and Townes had a cleft lip. He and his sister, Ellie, stayed in hospital incubators for a month. Their post-natal care cost about half a million dollars. When the twins went home they needed expensive machines to keep them breathing and their hearts beating. “Had it not been for the ACA our family would have been bankrupted and our children would have surpassed their lifetime limits before their first birthday. Thanks to the ACA I didn’t have to worry about that,” White said. 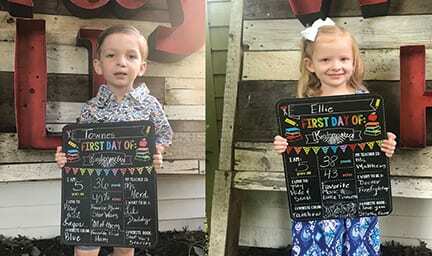 Last week White’s twins went to their first day of school She said they seemed just like the other kids and when left her they didn’t even look back. Jessica Hendricks was diagnosed with Hodgkin’s disease when she was 16. She beat her cancer, studied chemistry, and now works for the Center for Disease Control developing a test for the screening of newborn disorders. The ACA did not exist when Hendricks left school and when she looked for health insurance she couldn’t get any. “Denied, denied, denied, over and over, and they all said the same thing: ‘due to pre-existing condition we cannot offer you a health insurance policy’,” said Hendricks. Hendricks didn’t choose to have cancer. “I do not want others to ever have to endure that feeling or be denied the basic right I was denied,” she said. Jenny Rogers and her husband own a motel in Polk County. They both have pre-existing conditions. “My family knows what it’s like to live a world without protection for pre-existing conditions and that’s a world we must not go back to,” she said. Before the ACA Rogers’ chronic bladder disorder cost $1900 a month in premiums just for herself. The family couldn’t afford it. But under the ACA they can. If it goes away Rogers said they will burn through their retirement savings and probably have to sell their business. “If the so-called pre-existing conditions are ruled unconstitutional by the courts, a vote that could be determined by Kavanaugh, then that is the decision we will be faced with and we won’t be alone. Lives will be shattered, homes will be mortgaged, small businesses like ours will close, and lives will be lost,” said Rogers. Andy Spears, Executive Director of Tennessee Citizens Action, a consumer advocacy group, thinks Kavanaugh’s history indicates he won’t protect people with pre-existing conditions. “The next justice will likely have a chance to weigh in on this issue,” said Spears. He said there are 2.7 million Tennesseans with pre-existing conditions. Senator Alexander, who heads the Senate Health Committee, wants to get rid of the ACA but he is in favor of its protection for people with pre-existing conditions. “Senator Alexander should heed his own words and he should stand up for Tennesseans and oppose Brett Kavanaugh,” Spears said. The lawsuit against the ACA could take years to get in front of the Supreme Court but the next Supreme Court judge could be confirmed by October. Most mainstream commentators say Kavanaugh will pass muster in his senate confirmation hearings. The confirmation is a simple majority vote. There are 51 Republican senators, 47 Democrats, and 2 Independents. In a recent Rolling Stone interview, Supreme Court expert David Kaplan predicted Kavanaugh will be confirmed with 55 or 56 votes. 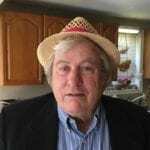 He says all Republican senators will vote yes and so will a few Democrats. But if Alexander and Corker break ranks and vote “No” Kavanaugh’s nomination could be in trouble. The Democrats have tried to delay the hearing by asking for more records of Kavanaugh’s legal history. One thing could derail Kavanaugh’s confirmation: Special Prosecutor Robert Mueller could indict President Trump on obstruction of justice charges stemming from the investigation into Russian meddling in the 2016 election. If that happens soon, the Democrats will immediately try to impeach the President and Kavanaugh’s confirmation hearing would likely be put on hold.